I have been selected for a Versatile Blogger Award by T'onna @ Navy Wifey Peters. Woohoo! This is my first blogging award, and it feels awesome. I first discovered T'onna when she made these adorable Florida Gator Sock Monkey Hats. If Little O didn't have such an enormous head, I would snap one up so fast! Select 15 bloggers that you've discovered recently or follow regularly. 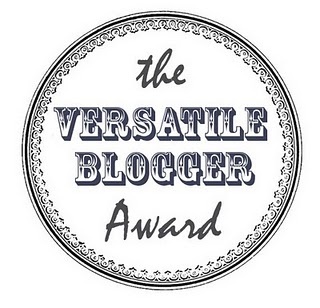 Nominate those 15 bloggers for the Versatile Blogger Award (include a link back to your post). Finally, tell the people you nominated (and other blog readers) 7 things about yourself. I'm a third generation Gator. My grandpa went there, my dad went there, and I went there. I truly do bleed Orange & Blue. My baby is about to turn 2. I can't believe it. I have too many pets. 3 cats, 1 dog, and 1 bird (who just turned 20). My favorite color is orange, and I have an orange SUV. I am only truly happy when I'm busy, but I complain about being busy a lot. I recently joined our local chapter of the Modern Quilt Guild, and it's helping me to learn a ton of new sewing techniques. (I recently learned to sew a zipper). I get ridiculously excited when people comment on my posts. Nerd alert! Thanks again, T'onna for choosing me for a Versatile Blogger Award! Hey Jessica! Just wanted to let you know that my blog address has changed. Long story... I've moved everything over to http://www.usscrafty.blogspot.com. I hope you'll follow me there! Thanks for letting me know. I've gone ahead and followed you there. Such a pain for you! !